Welcome! This lens is the fourth lesson in a semester-long undergraduate-level course in Human Anatomy. 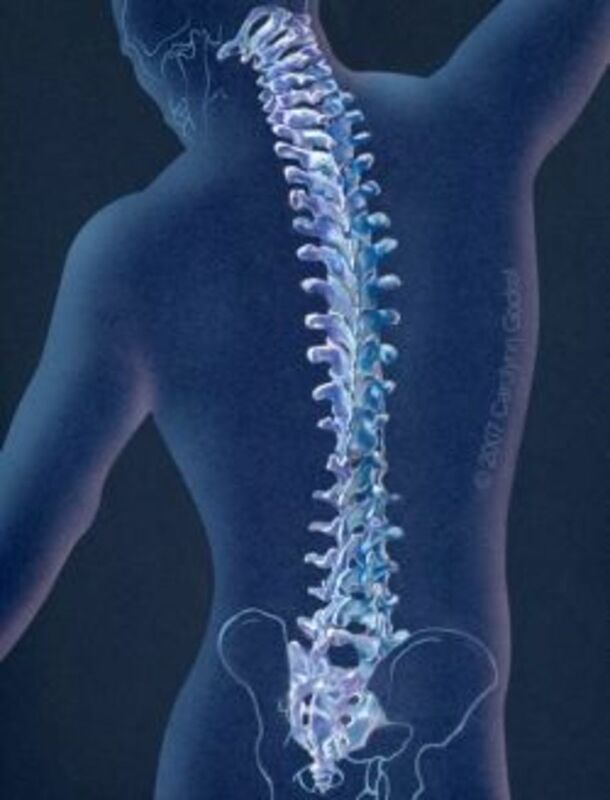 Now that we have covered the bones, joints, and ligaments of the spine, we can move to the spinal cord and other structures in the spinal canal and the spinal nerves which are the means by which the spinal cord communicates with the rest of the body. In this lesson, I will discuss different ways to partition the PNS and cover the gross anatomy of the spinal cord, the structures in the spinal canal, the anatomy of a spinal nerve, and the organization of spinal nerves in the body. I will also briefly cover embryonic development of the body wall, which is necessary to understand how the spinal nerves are arranged in the somatic nervous system. By the end of this lesson you will know enough about the somatic nervous system and spinal nerves to understand details about the nerves in each region of the body. This is a very good book about anatomy and function of the nervous system - students might find it useful if they go on to study neuroanatomy or neurology. The brain and spinal cord make up the central nervous system (CNS), and the nerves that come off the brain and spinal cord to innervate structures in the body wall and limbs make up the peripheral nervous system (PNS). Study of the CNS is the province of neuroanatomy and histology, so we will not worry further about details of the CNS except, later, when we talk about gross anatomy of the brain, and in this lesson, where we talk about the spinal cord. We will, however, investigate the PNS in more detail. 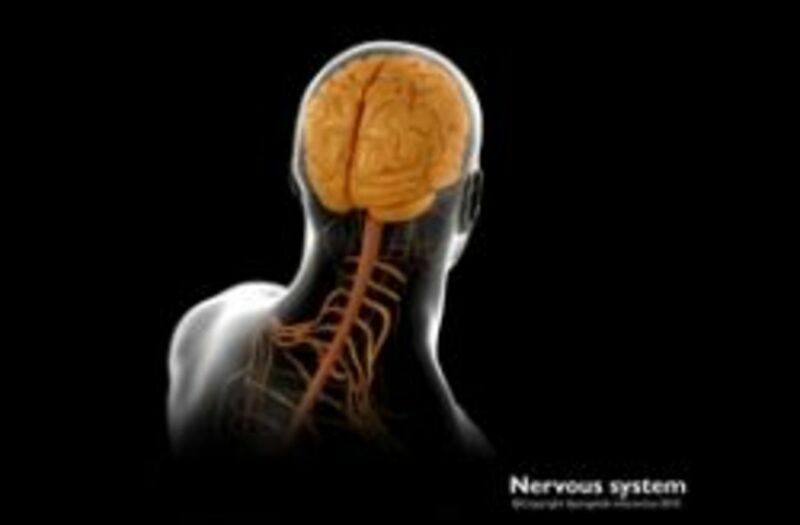 The main anatomical division of the nervous system is the one we've already discussed, the division into CNS and PNS. There are several other ways to partition the nervous system along functional lines. The first such division is between afferent and efferent. Any nerve cell that carries instructions from the CNS outward is an efferent fiber (from the Latin for "away from") and, along with its cell body, makes up an efferent neuron. Most efferent neurons innervate glands, muscle, and other motor tissues of the body and therefore comprise the motor portion of the PNS. In the motor portion of the PNS, nervous tissue related to striated voluntary muscle is under somatic motor control, whereas smooth muscle, cardiac muscle, and glands are under visceral motor control. Most of the body wall is under somatic motor control, with the exception of vasculature, arrector pili muscles, and sweat and sebaceous glands, which are under visceral motor control. 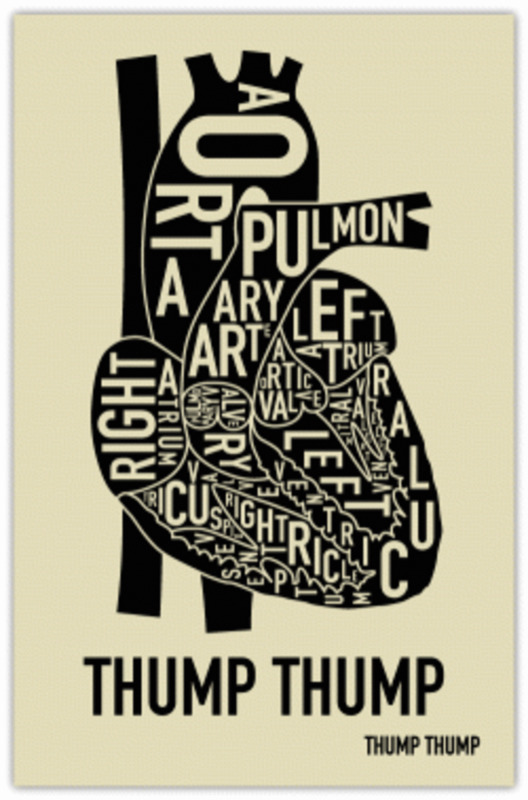 All the internal organs of the body are under visceral motor control. Any nerve fiber that carries information back to the CNS from the body is known as an afferent fiber (from the Latin for "toward"), and, along with its cell body, makes up an afferent neuron. Most afferent information comes into the CNS as conscious sensation such as temperature, pressure, vibration, stretch, and pain, and forms the sensory part of the PNS. So, somatic motor fibers stimulate striated muscle tissue; visceral motor fibers innervate smooth muscle, cardiac muscle, and glands; somatic sensory fibers transmit conscious sensation from striated muscle tissue; and visceral sensory fibers transmit unconscious sensation from visceral structures. 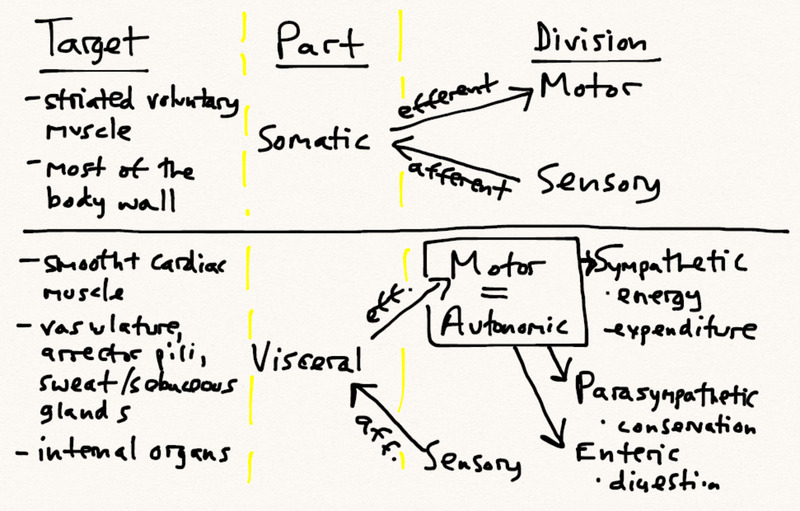 Visceral motor fibers make up the autonomic division of the PNS, which can be further divided into a sympathetic part, a parasympathetic part, and an enteric part. The sympathetic part of the autonomic division is associated with energy expenditure during moments of great effort or exertion (i.e., fight or flight), and innervates visceral motor tissues in the body wall and internal organs; the parasympathetic part is associated with energy conservation in the internal organs; and the enteric part is concerned largely with digestion, and occurs without CNS input. We will cover the sympathetic part of the autonomic division more fully in lesson 5, and come back to the parasympathetic part when we cover the thorax, head, and neck. In the brain, the cerebral hemispheres are made up of an inner core of myelinated "white" matter surrounded by unmyelinated gray matter. In the spinal cord, the pattern is reversed, and an inner "H"-shaped horn of gray matter is surrounded by white matter. 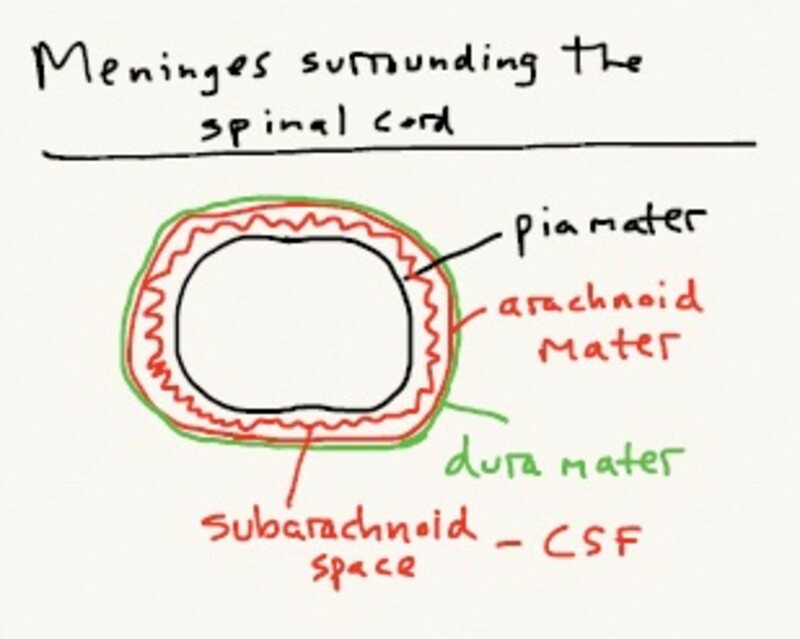 The spinal cord is circular to oval in cross-section and overall long and cylindrical. The spinal cord extends from the non-cortical brain down through the foramen magnum and spinal canal to between L1 and L2 vertebra on average. The cone-shaped distal end of the cord is called the conus medullaris. 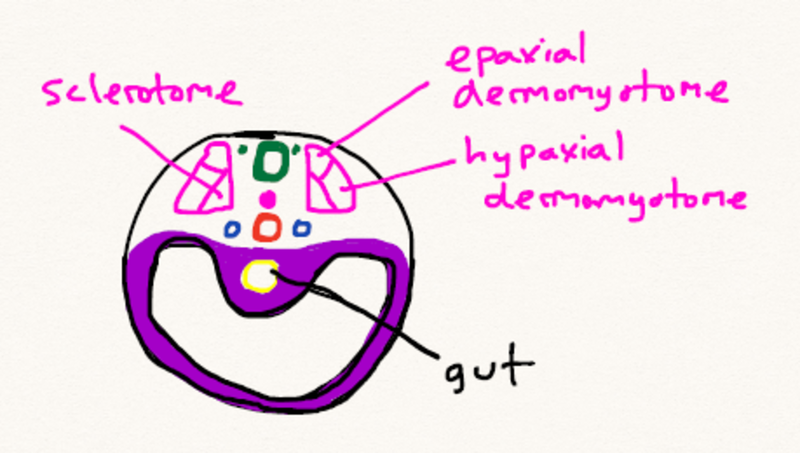 Arachnoid mater extends inferiorly beyond this point as the pial part of the filum terminale, and the dura mater extends inferiorly as the dural part of the filum terminale, which runs far enough inferiorly to attach to the coccyx. The external surface of the spinal cord is marked by a number of fissures and sulci, including the anterior median fissure, the posterior median sulcus (or fissure), and the posterolateral sulci (sing. sulcus) on either side of the posterior median sulcus. Posterior rootlets of spinal nerves enter the spinal cord at the posterolateral sulci. A number of arteries supply the spinal cord. First, one anterior and two posterior spinal arteries run down the length of the spinal cord. The anterior spinal artery runs in the anterior median fissure and the posterior spinal arteries run in close approximation to the posterolateral sulci. Second, segmental spinal arteries enter the vertebral canal through the intervertebral foramina. These arteries arise from the vertebral and deep cervical arteries in the neck and other arteries in the thorax and abdomen. The segmental spinal arteries give rise to anterior and posterior radicular arteries, which follow the path of anterior and posterior roots at every spinal level. In addition, the segmental spinal arteries give off segmental medullary arteries in several spots, which reinforce the longitudinally-oriented anterior and posterior spinal arteries. Several sets of veins drain the spinal cord: anterior and posterior spinal veins that parallel the anterior median fissure and posterior median sulcus, respectively; two pairs of unnamed veins on either side of the longitudinal veins which bracket the anterior and posterior nerve rootlets; and an extensive plexus in the epidural space of the vertebral canal which drains the anterior and posterior spinal veins, and which in turn drains into larger veins in the thorax and cranium. The anterior wall of the vertebral canal is made up of vertebral bodies, IV discs, and the posterior longitudinal ligament; the lateral walls are made up of the pedicles and intervertebral foramina; and the posterior wall, or roof, is made up of the laminae and ligamenta flava, and by the roots of the interspinous ligaments and spinous processes in the midline. The spinal cord is surrounded by a number of meninges, or connective tissue membranes, and spaces: from internal to external, these include an innermost layer which drapes the spinal cord called the pia mater; the subarachnoid space which contains cerebrospinal fluid (CSF); a middle layer of arachnoid mater; and a thick external layer of dura mater, which is in close apposition to the arachnoid mater but is not attached to it; the epidural space, which contains loose connective tissue, fat, and a venous plexus; and, finally, bone and surrounding periosteum. The spinal dura mater is continuous with cranial dura mater in the interior of the cranium at the foramen magnum, and extends to S2, where it forms an investing sheath for the pial part and dural part of the filum terminale of the spinal cord before it attaches to the coccyx. In other words, the subarachnoid space extends further inferiorly than the spinal cord, like a loose-fitting sock, and the dura mater extends further still. 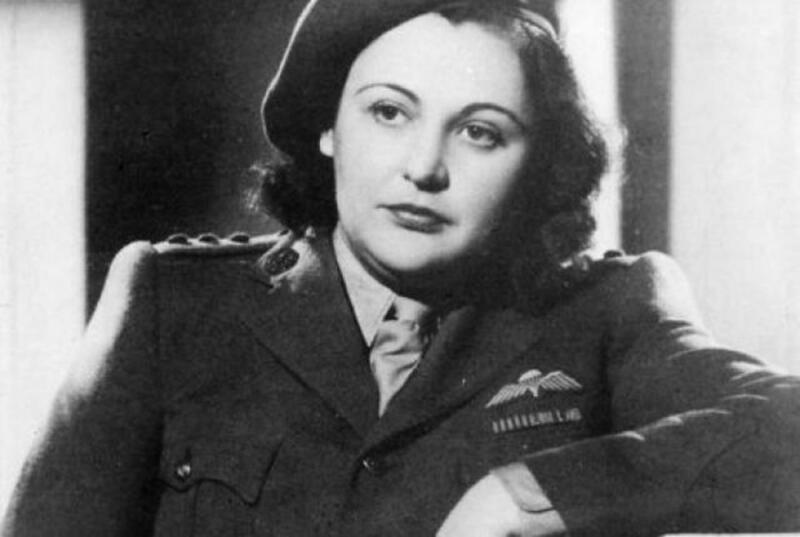 Pia mater, on the other hand, closely adheres to spinal cord and brain, so it ends with the end of the spinal cord proper. On each side of the spinal cord, a longitudinally-oriented sheet of pia mater called the denticulate ligament reflects back from the cord to become anchored through the arachnoid onto the dura mater. The denticulate ligament anchors the spinal cord and keeps it centered in the spinal canal. The spinal nerves are attached to the spinal cord and exit the spinal canal through each of the intervertebral foramina. 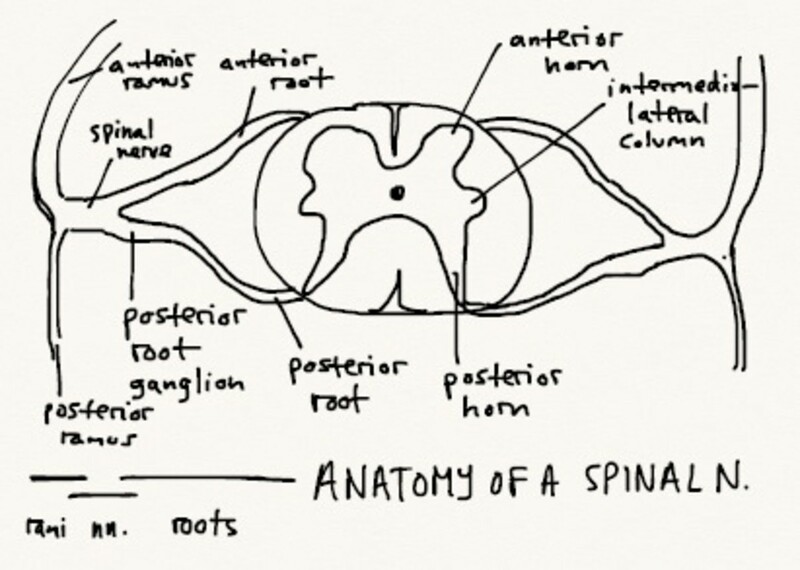 Starting from the inside out, each spinal nerve is attached to the spinal cord in the spinal canal by anterior and posterior rootlets, which converge to form anterior and posterior roots. The posterior roots contain processes of sensory neurons carrying information to the CNS, i.e. afferent fibers. The cell bodies of sensory neurons are located in spinal ganglia called posterior root ganglia at the distal ends of each posterior root in the intervertebral foramina. The anterior roots contain efferent motor nerve fibers. The cell bodies of motor neurons are in the anterior horn of the spinal cord. The two roots converge laterally at the level of the intervertebral foramen, at which point the structure is known as the spinal nerve, which runs for about one or two millimeters before emerging from the intervertebral canal and diverging into a large anterior ramus, which innervates the muscles of the limbs and trunk, and smaller posterior ramus, which innervates the intrinsic back muscles and immediately overlying skin of the back. The early embryo is internally segmented by division of paraxial mesoderm into somites on either side of the neural tube. Head segments are soon lost, but remaining somites develop from cranial to caudal along the developing spinal cord. 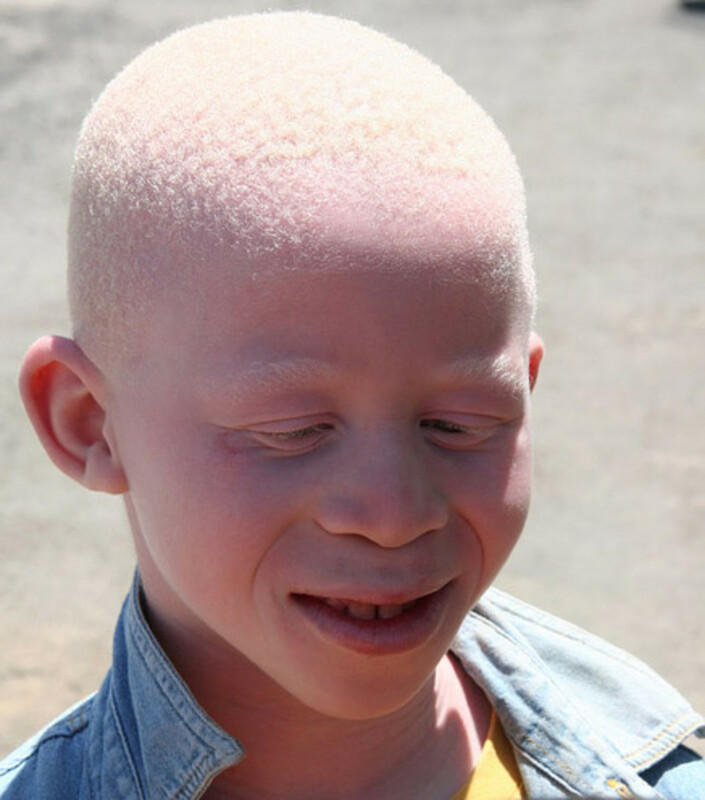 Each somite differentiates into a sclerotome that will later develop into a vertebra and ribs and a dermomyotome that will develop into skin and striated muscle. 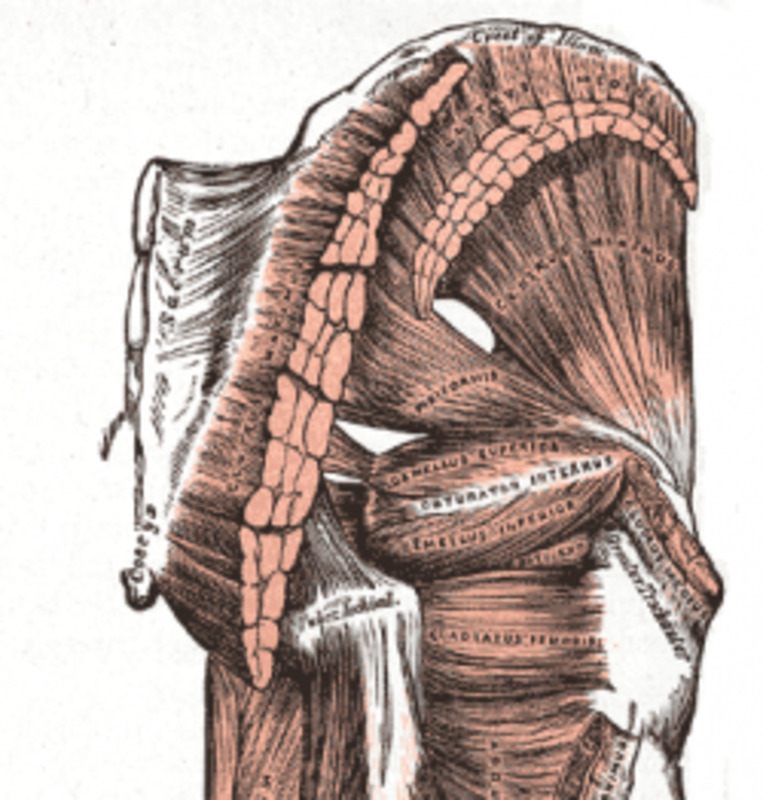 Each dermomyotome splits into a small posterior block of cells, called the epaxial portion, that will develop into deep muscles of the back and overlying skin; and a larger anterior block of cells called the hypaxial portion, which will become the striated muscles of the anterolateral body wall. The neurons that innervate these structures are called somatic motor neurons, and they are passed out of anterior roots attached to the spinal cord. All the structures from a single dermomyotome constitute a body wall segment, whereas each vertebra and the ribs are intersegmental, meaning that they are derived from two adjacent sclerotomes and therefore lie between body wall segments. During embryonic development, two motor axons grow out of the anterior horn of the spinal corn at each spinal cord segment: an anterior ramus, which pierces the developing hypaxial cells, and a posterior ramus, which pierces the developing epaxial cells. The anterior ramus will go on to innervate the muscles of the anterolateral body wall and limbs that develop from hypaxial cells, and the posterior ramus will go on to innervate the muscles of the deep back and overlying skin that develop from epaxial cells. Both of these axons run in the anterior root. Development of sensory innervation is a little different. In this case, neural crest cells in close approximation to the spinal nerve send two processes out: a medial process to the posterior horn of the spinal cord, which will develop into the posterior root of the spinal nerve, and a lateral process, which runs with the anterior ramus and posterior ramus to reach the hypaxial and epaxial regions innervated by the somatic motor system. The anterior root, therefore, only contains motor fibers, and the posterior root only contains sensory fibers; whereas the anterior and posterior rami contain both motor and sensory fibers. There are 8 dermomyotomes between the developing skull and first rib-bearing vertebra, so that the first cervical nerve comes out between the skull and 1st vertebra, and each successive cervical nerve comes out above its respective vertebra. Thoracic, lumbar, sacral, and coccygeal dermomyotomes are all inferior to their respective vertebra, so the respective spinal nerves for these segments all come out below their numbered vertebrae. Altogether, there are 31 dermomyotomes and, therefore, 31 body wall segments. There are extra somites after the coccygeal somites, but these degenerate completely. If they fail to degenerate, the infant will be born with a short tail. The region of the skin innervated by the branches of a single spinal nerve is called a dermatome, and the region of muscle is called a myotome. Dermatomes and to a lesser extent myotomes can be used by the clinician to diagnose problems with spinal nerves, since each spinal nerve innervates a specific portion of the skin and muscles, respectively. Now that we have covered the bones, joints, and ligaments of the spine in lesson 3 and the spinal cord, spinal nerves, and somatic nervous system in lesson 4, we will focus on the autonomic nervous system in lesson 5, the back muscles and movements of the spine in lesson 6, and the thorax in lessons 7 and 8. This lesson covers the autonomic nervous system, focusing on how sympathetic nerve fibers get to different parts of the body. Let me know how I did and any improvements you would suggest.